Urban India is sick. Yes, that is right. Across our cities, dengue and chikungunya are taking their toll—people are fighting high, even haemorrhagic, fever, excruciating joint pain and acute fatigue. There is some mortality, but what is worse, much worse, is morbidity—the number of days that illness-related disability is forcing people out of jobs and regular activities. Remember, this is even worse when people are employed under daily wages and our cities have millions of them. They cannot even take a day off; there is no sick leave available to them. These viral diseases, spread through mosquitoes, are debilitating. So let’s be clear and certain, we are sick in our cities. Let us also be certain that gross mismanagement of our city’s environment is making us sick. This, simply put, is the result of garbage, dirt and neglect that surrounds us in urban India. It is also a fact that dengue and chikungunya are urban diseases. Unlike malaria, where the female Anopheles mosquitoes breed in flowing water, the Aedes aegypti mosquito, the bite of which carries the dengue, chikungunya, yellow fever and even Zika viruses, breeds in stagnant water. Studies have shown that urban areas have a much higher prevalence of Aedes aegypti as compared to rural areas. 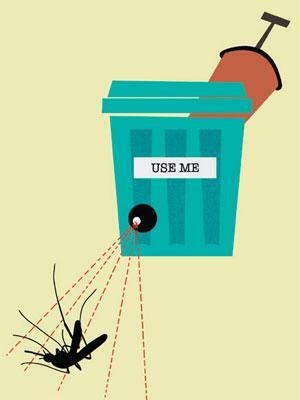 This mosquito has adapted to urban areas by moving from natural to artificial breeding habitats. The Aedes aegypti can breed inside an abandoned tyre or even a bottle cap with a little water. It can also spread the virus fast in urban areas. This is not because the mosquito moves over a large area. In fact, the range of the mosquito is only some 100 metres. What moves is the person bitten and infected by the mosquito. That person then transmits the virus to another mosquito, bred at another place, when it bites him or her. And in urban areas human density is high and so is the rate of transmission. This is the revenge of the mosquito. This much is clear. Everything else is unclear. Governments do not know how big the problem is. It is well-accepted that the data collated by the National Vector Borne Disease Control Programme is grossly under-reported. Although dengue and chikungunya are notifiable diseases in many states, only the cases confirmed in laboratories are considered in the final statistics—and we know that in most cases there are symptoms but no confirmation. Then many do not get tested or even go to hospitals. So we just do not know the scale. We do not even know the cause of sickness. Even when patients have every symptom of dengue or chikungunya, tests to confirm the virus come back negative. Doctors say this could be because the tests are not sensitive enough; or because the virus has mutated; or it could be another virus altogether. It is a mystery, they say. We do not even know what makes Aedes aegypti tick. Conventional evidence shows it thrives only in clean water, so even today municipal agencies target overhead and other clean water tanks in households. But this misses the fact that Aedes aegypti breeds wherever stagnant water is relatively clean. The connection with climate change is also unclear. The fact is climate change is leading to more intense rain and periods of more intense sunlight. This provides the ideal conditions for the mosquito’s propagation. Unseasonal rain is also prolonging the breeding period of mosquitoes. So what do we do? In Delhi, now that the public health crisis is full-blown and deadly, politicians are vying to get photo shoots with fogging machines spraying insecticides across colonies. But it is well known that this will not work. Even if the adult mosquito is killed; larvae will survive. Breeding will continue and resistance will grow. This is not the way to go. To stop mosquito breeding, all the conditions conducive to its breeding will have to be removed. In cities, this means cleaning up big time. There is no other option. It is also clear that for too long we have allowed filth to grow in our vicinity. We have done this because there does not seem to be any immediate or apparent health cost to us. It looks bad, yes. But we have learnt to live with it. The only time urban India was shaken and stirred from its apathy towards filth was when plague hit the city of Surat in Gujarat. The city smartened up and has not looked back since. The question is: why do we not make this health connection? That’s because departments are different, health and municipal services; focus is on disease management; fogging and pushing insecticides are easier; and the evidence on the connection is never used for policy-making. Even today, we do not comprehend that mosquitoes do not move far and wide, humans do. Disease transmission requires mosquitoes as carriers, so mosquitoes have to be our target and obsessive cleaning up, our only objective. Dengue and chikungunya are urban India’s nightmare. They will haunt us. They will make us sick. So clean up, obsessively. The basic problem is not departments but it is the rulers utter negligence on such serious issues. In the two Telugu states this is glaringly seen. In Telangana the ruling class as well the opposition are more worried on dividing the 10 existing districts to 30 or 40 or 50 so that they can have their own real estate boom in their respective support base zones. In Andhra Pradesh state the government is more interested in shifting the capital to Amaravati temporary structures and giving sermons to counter opposition while opposition is more on war path for special status to state as this gives boost to people of the state. Filth, uncleared garbage for days and weeks, poor civic sense, et al have all become the chronic malaise of this supposedly largest democracy. Don't we have skills and resources to clean up? Yes, we have, but our skewed understanding of Karma makes us believe it is the job of govt known for stupid management run by political idiots.